Last week ?uestlove opened Pandora's Box not by criticizing Iggy Azalea as an interloper in hip-hop but by DEFENDING her place in the music and culture of 2014 as "a game changer." Sayeth Mr. Thompson: "You know, we as black people have to come to grips that hip-hop is a contagious culture." I encourage you to read the full article so that we don't shortchange or misrepresent his position on the issue but to briefly summarize he's implying that Iggy's status is a NON-issue. He's even cool with the Australian-born rapper mimicking an American and arguably Southern rap accent. "I'm in the middle of the approximation of the enunciation, I'll say. Part of me hopes she grows out of that and says it with her regular dialect - I think that would be cooler. But, yeah, 'Fancy' is the song of the summer." Apparently it's all good in the 2-1-5. The debate about whether Iggy's faux-Southern accent was acceptable either in the U.S. hip-hop scene or to her Aussie peers back home leads inexorably to a discussion that's been quietly simmering for some time. A few of my peers from the rec.music.hip-hop kicked it around after ?uest dropped his bombshell and the conversation surprised me by noting that Iggy was essentially doing what black rappers from New York had already been doing for years - mimicking their Southern counterparts. It's easy to paint a face on cultural appropriation when a "white rapper" is doing "black music" but when a Harlemite like A$AP Rocky goes viral with the kind of slow, syrupy rap that's traditionally thought of as Southern it seems to get the same free pass that Mr. Thompson is offering Ms. Kelly. In hindsight all the discussion of the white girl wearing the gold grill in his "Purple Swag" video could even be read as a distraction tactic - letting the focus on hip-hop appropriation be directed her way instead of his, despite the fact he was branding himself "Texas trill" in his lyrics. What's in a swagger jack, and how much jacking is going too far? When Chuck D branded Elvis Presley "straight up racist.. simple and plain" it was easy to understand the context: Elvis had clearly adopted the rhythm 'n blues music he heard in his style, and many of the songs he covered in his career were done first by black musicians who did not receive the same fame or accolades as Mr. Presley. The question of whether or not Presley was intentionally racist turns out to not be quantifiable in simple polemics, and much like Iggy Azalea may in fact be due to a genuine love of the music and culture he performed. There's as much or more anecdotal evidence to say Presley wasn't a racist than to confirm he was, but Public Enemy's music colored my view on the issue to the point that I still view his legacy with an eye of suspicion. "Most of my heroes don't appear on no stamps." 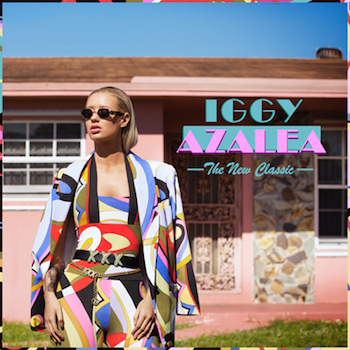 Iggy Azalea presents a much more easily identifiable target than Elvis Presley. From Tupelo to Memphis, Presley's background made him sound like the artists he admired, simply by growing up in a Southern environment. Azalea hailing from Australia means that to most observers here or overseas that she should SOUND Australian, although as some of my RMHH friends said there are certain Aussie rappers who "lay it on thick" to purposefully sound LESS like their American counterparts and win over the local fans. Accents add a dimension to swagger jacking that makes it infinitely more complex to decide if someone is perpetrating a fraud. Is Action Bronson really a Ghostface Killah ripoff, or is it fair to say they sound like each other because they BOTH sound like New York City? Thus the issue of what is "cultural appropriation" and what isn't can't be simplified to the degree ?uestlove intimates when he says "hip-hop is a contagious culture." That's certainly true or a white kid born in Iowa wouldn't be writing an editorial about the subject right now. Though my friends in the 1990's liked to joke that "Whiteboyz" was based on my life story, I had more respect for hip-hop than to affect an accent and act like something I was not. I was convinced then (and still am now) that being a "hip-hop nerd" was my contribution to the culture - being exactly who I am, born exactly where I was, but still being passionate about the arts. Since I'm not a performing artist that works for me. As hip-hop continues to grow though the debate is going to continue to shift. There will be Vietnamese rappers who sound like they're from New York, Los Angeles or Atlanta. There will be rappers from Seattle who sound like they're Australian. Do these examples seem extreme? Four years ago if you told me a white woman from Australia would sound like T.I. I would have said that was absurd too. ?uest may be right but it's still worth examining the kind of cultural appropriation that's not only outside but INSIDE hip-hop. Imitation is not always the sincerest form of flattery, and though I like both A$AP Rocky and Iggy Azalea, it goes beyond dope music at some point to an issue of originality. If everybody sounded like they were from the Bay, would the Bay still be as dope? Would Iggy be as hot if she sounded like she was from Minneapolis? Artistic creativity demands the freedom to imitate other regions, styles and sounds - and when West coast artists cover East coast rappers or vice versa we call it a tribute. I don't think Iggy is "paying tribute" to the South, but "Fancy" is definitely a big song, and there's an equally big opportunity to examine how we use "cultural appropriation" to describe or define artists.